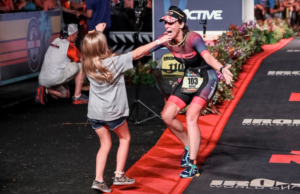 Fast forward to 2018: Rachel is now a mother of five, a wife, a lawyer, entrepreneur …and an Ironman triathlete. Excerpt: “Three years ago, a friend invited Rachel Brenke to give tri a try. Thinking it would be a good way to lose weight after giving birth to her fifth child, she agreed to join a few workouts. What Brenke didn’t know was that triathlon would change her life forever. ‘Triathlon makes me a better parent,” says Brenke, 34. “I’m not only setting an example for my kids, but it provides me the self-care I need, so that when I’m with my kids I’m with my kids. For more on Rachel, click here.